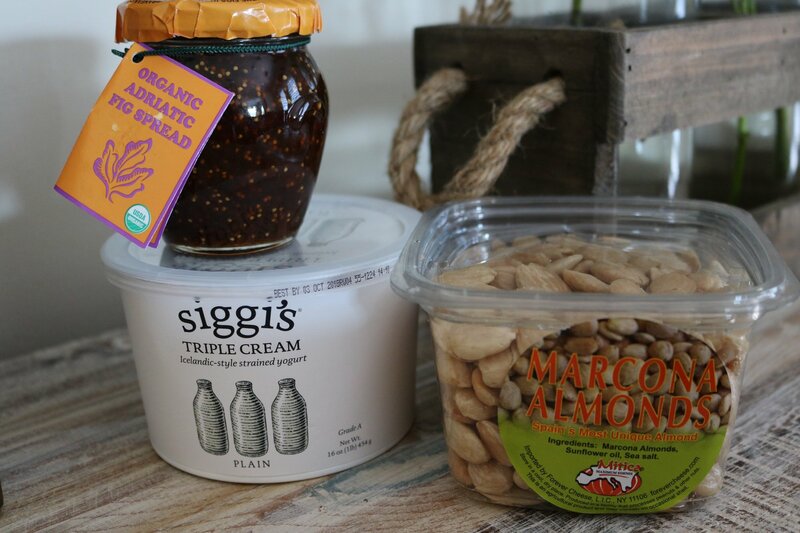 Dino's fig and marcona almond yogurt parfait is not so much a recipe as it is a suggestion for a fabulous food combination. I'd say the adult culinary combination to rival kids peanut butter and jelly, although, if your children are anything like mine, they'll want some of this delightful dish! It never fails, when I buy the ingredients someone shopping nearby will ask me about them. I have told so many fellow shoppers about this food combo, I decided I had to write about it so I can simply send people to my site instead of going into detail in the supermarket aisle. I can't take credit for this delightful idea as it was suggested to me by our “cheese guy” at Wild Oats Marketplace when we lived in Tampa. For those of you keeping track, Wild Oats was a health food grocery chain that was bought out by Whole Foods back in 2007. When the children were younger it was common for us to go on little excursions, or “one tank road trips” every weekend, or else take the boat out to beer can island for a beach side picnic. Before these mini adventures, we would peruse the health food shop for portable food items, often venturing to try something new. Our cheese guy, whose name was actually Dino, would often recommend various new cheeses for us to try. He would make pairing suggestions, crackers and veggies, not wine, though I'm sure to other people not dragging along a gaggle of children he probably did recommend some booze and cheese combos. 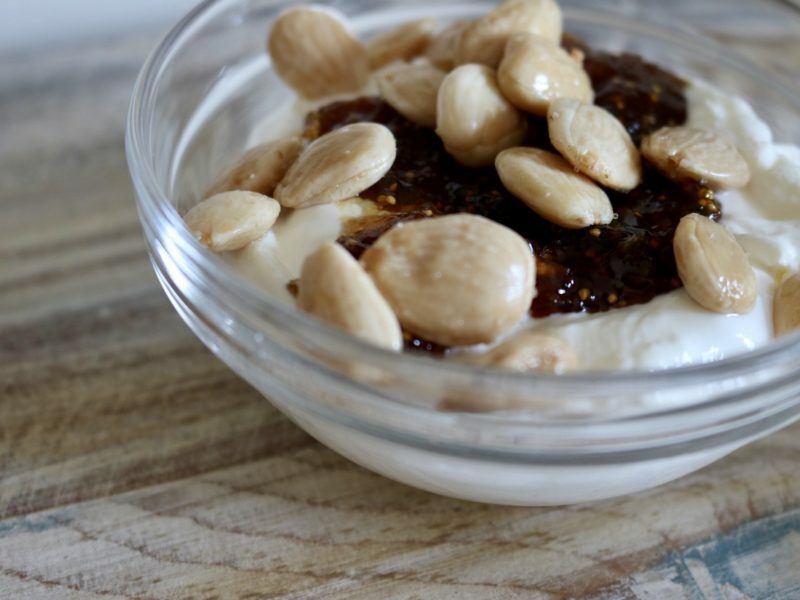 It was on one of these trips to Wild Oats that Dino suggested I take Greek Yogurt, top it with Fig Jam and Marcona almonds as a dessert-like dish that was healthy enough to stand in for breakfast as well. Once we tried the recommendation we were all hooked. In fact, I recall during my pregnancy with Harmon (and while the rest of my family escorted my mom to the airport) sitting down to eat a ridiculous portion of this treat while watching Memoirs of a Geisha. Thirteen years later, I still enjoy eating Dino's fig and Marcona almond parfait on the regular. Please continue reading to the bottom to find out why the exact ingredients need to be used with no substitutes. Top with jam and almonds. Regular almonds will NOT taste the same or give the required crunch that makes this dish special. For the true culinary experience, only Marcona almonds will do. For the yogurt, choose a thick greek yogurt, and preferably full fat. 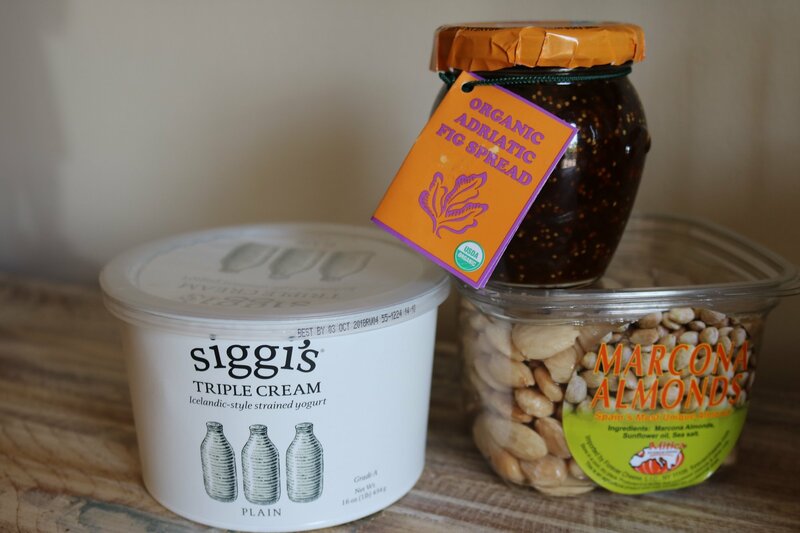 My top choice is Siggi's Triple Cream Icelandic-style strained yogurt because it is super creamy and thick. 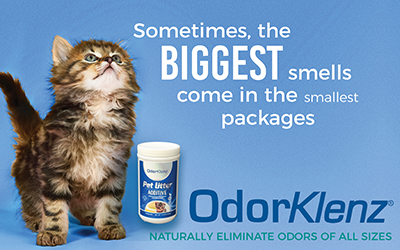 In addition, it has no sweeteners, no gelatin, nothing artificial and no preservatives. Just whole milk, cream and live active cultures. If you have read about probiotics here before, this is a yogurt that will give you all the probiotic benefits you want. I have eaten this dish in moderation and remained in nutritional ketosis. High fat yogurt can be a part of a healthy ketogenic diet, when chosen carefully, and eaten in proper serving sizes. Alternatively, try Fage Total (not the zero or 2%), or a cream on top style yogurt. Just make sure it is plain yogurt with ZERO sweeteners. 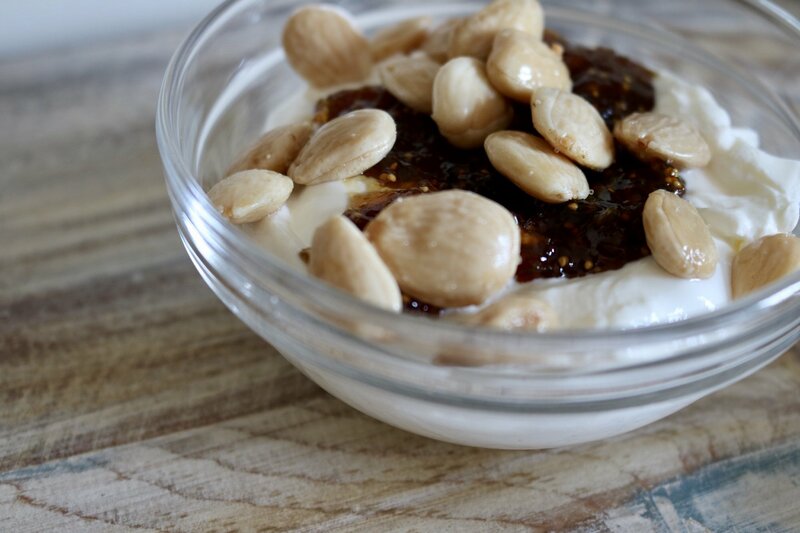 Although, if you follow the Trim Healthy Mama lifestyle and want to count this as an “E” dish, it could be iffy with nonfat greek yogurt, but the fig spread does have a small amount of cane sugar, so it's definitely a personal choice there. Using a sweetened yogurt will not only ruin the taste of this dish but the nutritional value as well. There's enough sweetness in the fig spread to carry the plain yogurt. Fig spread can be found in various places but I typically find this brand at Whole Foods nowadays. There are a couple of flavors, including one with orange, those are good but leave them behind, we just want pure fig spread. The brand I've been buying for around fifteen years is Dalmatia. This company uses the same traditional recipe since 1999 and you will understand why when you taste it. Other companies have tried to make knock off brands but I think you'll be happiest if you stick with Dalmatia. A little bit goes a long way. If you don't have a Whole Foods nearby, order it from Amazon: Dalmatia Organic Fig Spread. Figs are rich in soluble fiber which keeps you full longer and can help contribute to weight loss. Eating figs can relieve constipation and they are also rich in vitamins and minerals. Marcona almonds top this delicious parfait, and cannot be substituted! The Marcona almond comes from Spain and are frequently referred to as “the queen of almonds.” They are often fried in oil before packaging. So you may first notice that these almonds are a bit oily, that's okay! The crunch found in Marcona almonds is nothing like the texture of regular almonds, nor does the taste compare. Marcona's are shorter, a bit more round and the taste is less bitter and perhaps a bit sweeter in flavor. Look for Marcona almonds at Trader Joe's where they are toasted with rosemary or at Whole Foods (like what you see in these photos) but either will do for this parfait. Marcona almonds are full of heart healthy monounsaturated fat. A one ounce serving contains only 5 grams of carbohydrates with 3.5 grams being fiber. 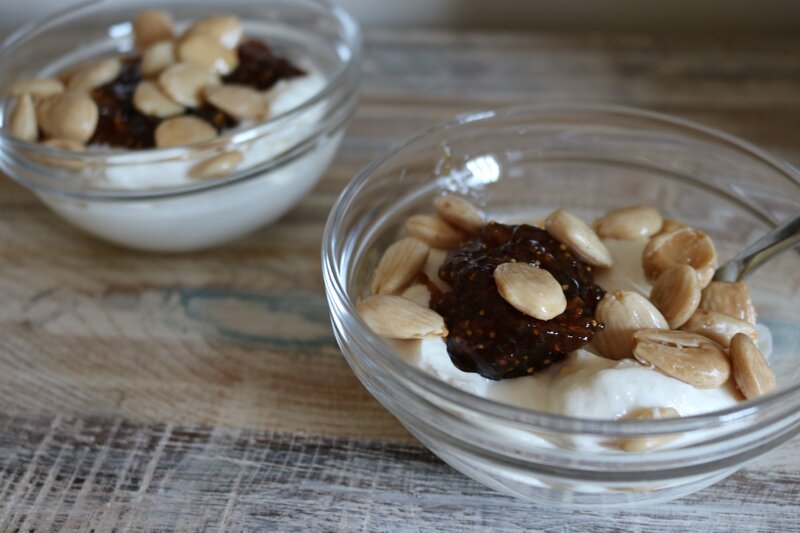 They boast a decent protein count at 6 grams per ounce and are a good source of calcium, iron, and Vitamin E.
To make the dish, simply put the yogurt in a dish, top with fig spread, and sprinkle with marcona almonds. I don't like to stir this up; just get a little of each ingredient with every bite. So yum! This dish is a quick go-to meal for breakfast but also delightful as dessert! You'll feel so healthy eating it, I promise. So, I hope you will try this family favorite and let me know what you think.